Sundays are my favorite cooking days. After filling my morning with roller derby craziness, I love taking the afternoon to unwind by preparing the next week’s meals. Today I spent the day making Seitan, prepping a bag full of green beans that I’ll stick in a crock pot sometime this week, playing around with fresh herbs and mozzarella cheese — in other words, coming up with lots of new vegetarian recipe ideas. After dropping by the Lawrence farmers’ market Saturday and picking up some of the biggest zucchini I’ve seen in a long, long time, I’ve been trying to come up with creative ways to use them before they spoil. 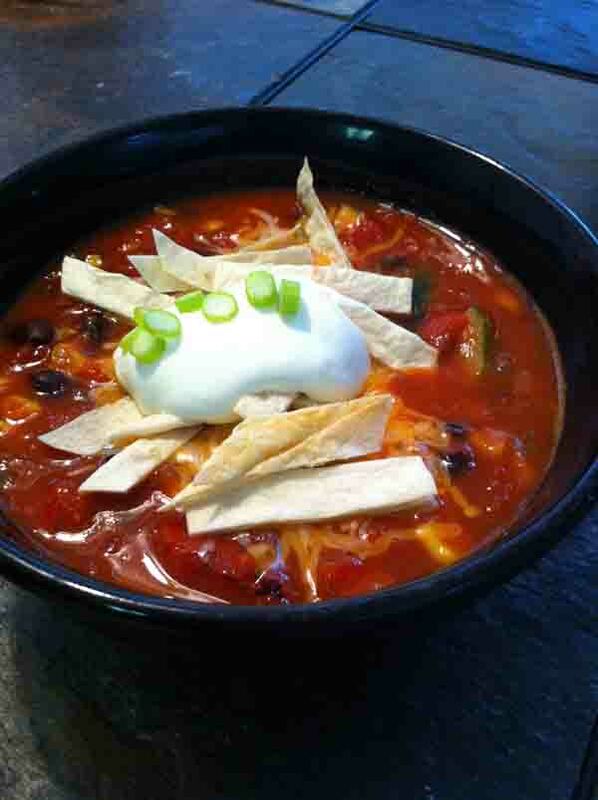 Tonight, I decided to experiment with something new — a veggie-loaded alternative to chicken tortilla soup. I was pretty happy with the way it turned out, particularly because I loaded it up with sour cream and cheese, and how can you possibly go wrong with that delightful combination? But mostly, it was perfect as a fresh, summery soup that’s good for your body, even with all of that dirty dairy in it. It was so delicious, I had to share my recipe. Don’t judge — I only have an iPhone for picture taking. Heat 2 Tbsp. olive oil in a pot over medium heat, then add onion, garlic and zucchini. Saute until tender. Add about 2 Tbsp. Mexican spice blend. I used a natural Mexican blend that contained chili peppers, onion, tomato powder, paprika, cumin, garlic, cilantro, oregano, and cayenne. I also probably added a lot more than 2 Tbsp., but I tend to be heavy on my flavoring because I love love love spices. Add corn, black beans, and tomatoes, making sure you don’t drain the fire roasted tomatoes. Add vegetable broth, and the juice from the lime. Let it cook for about 10 minutes to allow the flavors to blend. Oh, and add that salt and pepper to taste. Finish with about 1/4 cup of fresh cilantro, then top the soup with crispy tortillas (I cut mine up with a pizza cutter and baked it at 350 degrees for about 10 minutes) and that organic dairy I was talking about earlier. Finally, load up, chow down, and when you’re done eating, pat yourself on the back for putting such great things in your body. And then tomorrow, I’ll destroy it all when I introduce you to my new song: It’s Donut Time.